Avoriaz was the brainchild of Gerard Bremont who wished to create a ‘St. Tropez de Neige’ for the jet set of the time. To this end he hired bright young architects to design an alpine village inspired by Le Corbusier. The result is all high rise buildings and acute angles. Initially a playground for the rich and famous, Avoriaz is now much more mainstream. The best places to stay in Avoriaz are those with the best access to the slopes and you'll find plenty here that are ski-in ski-out. The resort is on the main circuit of the vast "Portes du Soleil" - one of the largest ski areas in the world with around 700 kilometres of piste across France and Switzerland. There are runs here for all abilities and it's a great destination for both families (easy access to the slopes and car-free resort) and couples alike. Avoriaz has also become a top downhill mountain biking venue and the resort has been a frequent host of stages of the Tour de France. It also caters for trekking, golf and many other summer outdoor pursuits. Ski or board the beautifully manicured pistes with runs for every ability. Get an adrenaline kick on a high speed downhill mountain bike trail. Explore the miles of scenic hiking trails. Play a round on the picturesque Golf Club Avoriaz. The best places to stay in Avoriaz are busy both in winter and summer, so if you want to guarantee a room (especially over New Year or February half term), get organised and book early. Hotel des Dromants is a luxury hotel featuring a quirky ultra modern design. Retro rooms take their inspiration from the 1960’s and most enjoy spectacular views. Plus there's an excellent restaurant specialising in Savoyard cuisine, a small spa, and the bar is a popular apres-ski hangout. Fly to Geneva Cointrin International Airport (80 km from Avoriaz). By train travel to either Thonon les bains Station or Cluses Station Genève Station. The ski season runs from December to mid-April. For hiking or mountain biking plan your trip between June - August. Browse our list of the best places to stay in Avoriaz. Widen the net to include Morzine. A luxury hotel with quirky contemporary design. Cosy, near futuristic rooms, with sixties inspired colouring and plush carpets. The restaurant features Savoyard specialties and there's also après-ski fun at the bar. A small spa for relaxing. Skiing starts straight from the door. Uber chic. 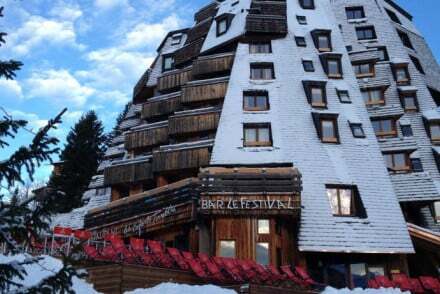 Groups - Ski groups will love this quirky and fun hotel, with a happening bar, in Avoriaz, a purpose built ski resort town.